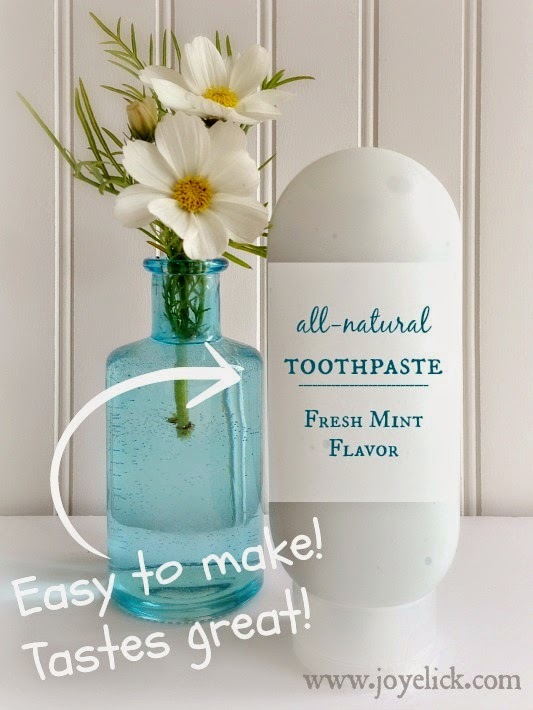 Still trying to find the perfect homemade toothpaste recipe? If you're trying to live self-sufficiently, you've probably attempted to make your own toothpaste before (or it's on your list of things to do). Toothpaste is just one of those things we can't seem to live without when we're striving to be self-reliant. 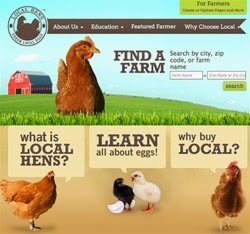 But has it been hard to find a good recipe you're willing to stick with? Keep reading, because today you're about to discover something new! For me, making my own toothpaste was a necessity, as I kept having allergic reactions to the every-day brands. And no wonder! Commercial toothpastes are loaded with industrial chemicals (such as sodium lauryl sulfate) that should never touch the inside of a person's mouth! Even many "healthy" brands that cost double the price still contain questionable ingredients. I set to work. First, I tried recipes with a coconut oil base and baking soda (but they turned watery in my mouth and left a nasty mess in my sink and drain). Then I tried clay based recipes (but they tasted bitter and aggravated sensitive teeth and gums). So I started experimenting. I wanted my homemade toothpaste to perform the way I'd come to expect of toothpaste. It had to taste good. Not oily, not watery, not bitter, not salty. I wanted my toothpaste to foam, but with something natural, not an industrial detergent. My toothpaste had to contain only truly healthful ingredients. It had to feel like toothpaste in my mouth, and work effectively to clean. Now here's the good news: I believe today's recipe does all that! Even the bubbly foaming thing, thanks to a simple, completely natural "secret" ingredient. Now I'm going to share my recipe with you. 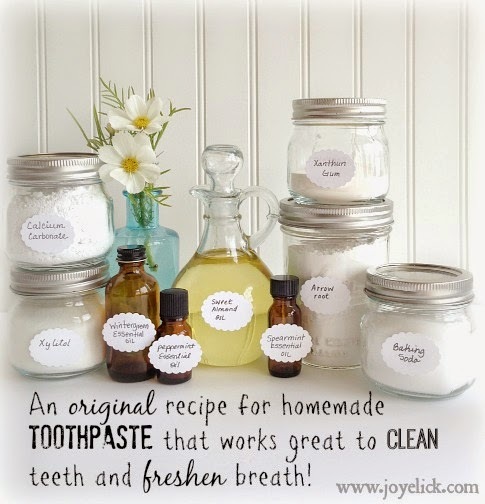 Also note, once you buy these ingredients, you will have enough to make approximately 4 batches of toothpaste (with several ingredients lasting much longer than that for future use in more toothpaste, or other products). 1/2 tablespoon arrow root (Find it HERE) (This is the secret to smooth-textured, foaming toothpaste)! STAGE 1: Prepare the "secret ingredient": Arrowroot. 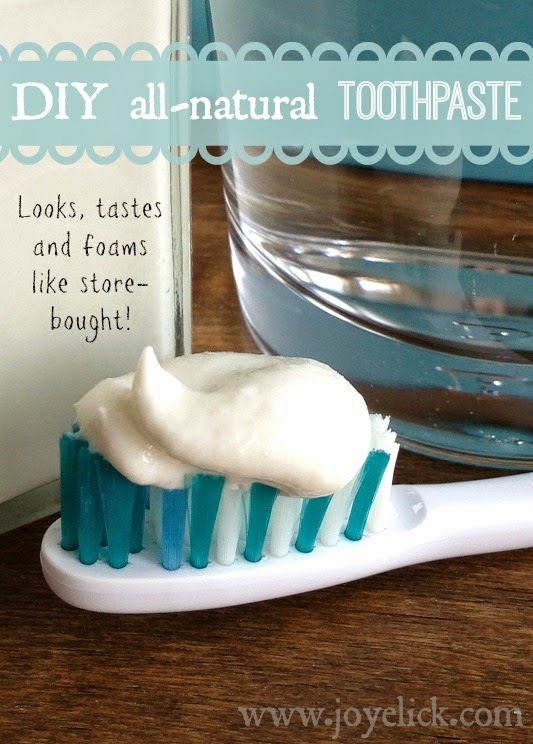 Arrowroot is the magic that makes this homemade toothpaste steal the show! It's what gives the paste a smooth texture and consistency, and makes it foam just enough to feel the way we expect toothpaste to feel. In a small sauce pan, heat the arrowroot and water over medium-high heat, stirring constantly until thick and smooth. When done, pour into a small glass dish and place in the freezer to cool while you prepare the rest of the ingredients (or for about 10 minutes, but not long enough to freeze). Move to stage 2 while the arrowroot cools. STAGE 2: Prepare the paste. 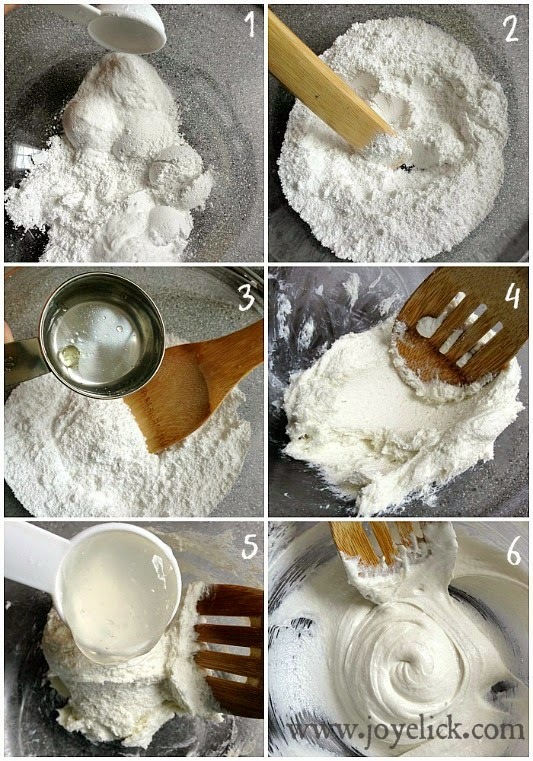 Place the first 4 dry ingredients in a medium bowl, and stir to combine. Measure the sweet almond oil and essential oils into a dish (in the photo below, I used a measuring cup because it was handy). Add the water to the oils. Now add the water and oil mixture to the dry mix, stirring as you pour. Mix with quick strokes until a stiff paste forms that looks like very thick butter-cream frosting. At first, the mix will appear very dry, and you may wonder how that small bit of moisture will ever make your paste wet enough. Don't worry. Just put some muscle into it, it will work. I use a rubber spatula to press and sort of knead the moisture into the mix, until it forms a stiff paste. When you add the arrowroot (next) your paste will turn out just right. Remove the dish of arrowroot from the freezer. Add it to the stiff paste, stirring briskly with whisking motions until smooth, sticky and slightly fluffy. Now it looks like toothpaste doesn't it! Smells good too. Put some on a toothbrush and give it a try! 3. Add the water and oils. 4. Stir to a stiff paste. 5. Add the arrowroot mixture. 6. Stir until a smooth and sticky paste forms. Any of these containers will work. It's up to you, based on your preferences. I'll offer a word of caution about using any kind of plastic storage, however. Having a squeezable container is nice and very convenient with toothpaste, but storing something made with essential oil in plastic could be risky. Over time, essential oils can leach chemicals from plastic into your product. I don't know how quickly this can happen, or if you would use your toothpaste up before this became a problem. For me, once I learned of this potential risk, I've since gone back to using glass jelly jars. Squeezing my toothpaste wasn't as important to me as keeping it toxin-free. Disclaimer: The information shared in this post is for educational purposes only, and is not meant to take the place of your dentist's professional care and advice. If you use this toothpaste recipe, it is with the understanding that you do so at your own risk. Best DIY ROLL-ON DEODORANT: Stop the stink for up 48 hours, no joke! Thanks, Candy. Glad you stopped by to check it out! Hope you'll let us know how it goes. More and more people are becoming concerned with how white their teeth are. Some may choose specific toothpaste brands to have their teeth whitened to remove discoloration, stains and spots from their teeth. Tried your recepie an LOVE it! I have sensitive teeth problems and so I'm experimenting with how much clove to put in. If I want it to foam more, can I increase the arrowroot to say one tablespoon and the water to one third cup? I assume that would not change the relationship to the other ingredients? Hello! I'm so glad you love this recipe and that you took the time to comment. Thanks! Regarding your question: Feel free to experiment, however, you may find that adding that much moisture to the thick paste may make it more runny than you'd like. I played around a lot with the moisture ratio when creating this recipe. If you do try it, and you like it, please comment back. I'd like to know how it works out. Good luck! Hi Melody,, Just getting ready to make a batch of this sounds like just what I've been looking for!! Would like to know tho, with the water in it, should the bulk of it be kept in the fridge? Or does it still have a pretty good shelf life? Chocolate and onions can also kills dogs and cats. The point is that not everything that humans like is good for animals. Xylitol is a natural sweetener, which is actually good for your teeth. It is a better alternative to sugar or aspartame. It is an ingredient in many commercial gums and mints, so keep these out of reach of pets. I am pretty sure this is a post to direct people to you page. Just to be clear though, do not give Farm Girl's recipe for homemade toothpaste to dogs or cats, since it does have xylitol in it. I have a question: Can I leave the baking soda out (I cannot stand the taste) and do you know how I'd adjust the recipe if I did leave out the baking soda? So glad to find this recipe! I was starting to think coconut oil and/clay were the only options out there! Hi Christen. I think I would use more calcium carbonate instead of salt. Let me know how it works! Melody Joy. I did put in about 1/2 tsp sea salt, though. I'm very pleased with my first batch of toothpaste. I used oils of vanilla, cinnamon leaf, nutmeg and peppermint. I used aloe Vera juice in place of the water and would've added a bit of colloidal silver if I wasn't out. I subbed Castor for the 1/2 oil. Tasty and my mouth feels so clean! I was thinking about adding a few drops of trace minerals. Think it would be ok? Or should I stick to my regular regime of simply adding it to my drinking water? Also, can I just add sea salt (Himalayan) or would I need to take something out? Hi- my daughter is allergic to nuts, so I would not be able to use the almond oil...would it matter if I use another carrier oil like avocado or apricot kernel oil? Hi! No it wouldn't matter. Any oil will work. I would choose one that is mild in flavor and then go for it! It is perfect! I used sunflower oil. Do you know what this costs, before I push the numbers? Thank you so much for the information about Xylitol and pets (dogs)! Thank you so much for that information. Sad outcome but hopefully this post will keep others from going through that pain of losing a loving pet! Now foods brand xylitol is not made from birch trees, it is made from corn. Not something I would use! Hi Melody, I have been using your toothpaste for over a year and I love it! It is my absolute favorite recipe and my dentist says its working well too :) I have a blog of my own as well, and was wondering if I could share this great post on it. Obviously I would explicitly state that it is yours and make sure everything is ok with you before sharing, but please let me know. Either way, thank you very much for this recipe! Thanks so much ! Even though not yet made and tried it. It sounds great ! I have been searching a recipe without greasy coconut oil or odd taste clay for years. So reluctantly I'm still using my own tooth powder recipe. I definitely will try it out. Thanks again, you are my sunshine ! You're welcome! Hope you will, many people like it very much. Thanks for your comment. Hi, I'm so glad I found this. I've got a corn allergy and from what I understand Xylitol is made from corn cobs. Could I substitute Stevia? Would it be a 1:1 replacement? Hi! I think you could substitute Stevia for Xylitol, though I'm not sure what the ratio would be. I think they make concentrated drops and also granulated. Just try it to taste and see what happens. Good luck! I made this exactly to the recipe, but it didn't foam at all. I've been sing natural expensive toothpastes for the past 18 months which foam a little. I'd like to achieve some foam with my homemade paste. Do you think adding a teaspoon of glycerine or unscented Castile soap might give some foam? I put my 2 tubes back into my measuring glas today and adjusted my xylitol, I'd used powdered and it wasn't the same weight as the granulated 5.5 TBSP. I also added 1/2 TBSP vegetable glycerin and 3/4 teaspoon liquid peppermint Castile soap plus another 1/2 TBSP calcium carbonate to keep consistency. Now my toothpaste foams just enough to make it feel right to me. Thanks for the original non cocoanut recipe! Do you think this paste will be too thick for a glass serum bottle? Or perhaps a glass bottle with a lotion pump? I'd love for my kiddos to use this natural toothpaste, but I think the jelly jars with a spatula would be too messy for them. I scored 2oz pet jars on Amazon. My 4yo has no issues scooping a bit with the tip of her (dry) toothbrush. I'm all for reusable glass jars, but not in bathrooms where bare feet hang out. Hi, I have tried the pump idea, but you end up wasting a lot of the products that sticks to the sides and bottom and pump inside the container. Thank you sooo much for developing this recipe. I just made some and am very happy. So nice not to feel a slave to the store bought stuff! I made this and LOVE it!!!! I had to substitute Grapeseed oil, and I split the contents in half after I made it. That way I can use different essential oils, and I can wash the jar sooner than later. (Since I am dipping my toothbrush in the paste) I added 15 drops of Peppermint and 10 drops of Cinnamon Bark to half the amount. It tastes really good, kinda like Big Red gum. Thank you for sharing the recipe! I made it as per the recipe and found that within a couple days the mixture went from being toothpaste like to liquid. What happened? Hi Christine, I'm not sure why this happened. This has not happened with mine, and I've made it many times. How much essential oil did you use? My only suggestion would be to make sure the tablespoon of powder ingredients is packed firm each time, and maybe use 1/2 teaspoon less of water, only adding it if the mix is too stiff when stirring. This happened to me, too. I've made it twice, and packed the dry ingredients while measuring, made sure not to use any more water than stated, but it's been very liquid-y both times. This time I added another tablespoon of the calcium carbonate to try to thicken it up but that didn't work. It still tastes great and works well. Is there a xylitol alternative? Hi, yes, you could try Stevia. I haven't tried it, but I've heard from others that is works. Good luck! Is it possible to make it without water? What would be the formula? I don't want to use preservatives. Hi this recipe works well but I'm wondering about the arrowroot. It's a starch and starches are broken down into sugars by saliva. I'm not sure that toothpaste that turns into sugar is a good idea? What non carbohydrate substitute could be used? Agar is also a carb.. This is what immediately struck me about this misguided concoction. There are going to be pockets and crevices and areas where the carbohydrates are going to remain, and it only takes a few micrograms for the bacteria to start cracking party-favors. Thus, after brushing, you'll have to rebrush with water to get everything flushed out. But this negates one of the major virtues of baking soda: a residual anti-bacterial pH. What is really needed in a dentifrice, and you can't buy anywhere, is a least-foaming, most pasty, mix that does not encourage salivation and watering-down, which exactly what is made worse by essential oils, sweeteners (forget Xylitol in toothpaste: its advantages apply better to gum and mints), etc. Soda already makes your mouth water, I'd want something that would counteract that. So, I'll have to look elsewhere for a formula. Is this toothpaste abrasive? I have caps and I'm not supposed to use abrasive or whitening toothpastes because it will scratch their reflective coatings. Thanks! Hi! You should check with your dentist for this question. Your dentist should be able to tell you if this toothpaste is a good match for your needs based on the ingredients. Hi Melody, Can't wait to try your toothpaste recipe. I'm wondering if one could substitute Stevia in place of the Xylitol? Your view on this would be greatly appreciated. Do you need to store this in the refrigerator? It not, how long do you think it would last on the bathroom counter? Thanks! Can it be used on bridges? I also have a fake tooth. Thanks! Hi Melody, I've come to your post after trying numerous types of coconut oil-based recipes for toothpaste, but miss the foamy action and taste of toothpaste. Your recipe seems sound, but I only had a couple of questions, please. For instance, I was wondering what is the reason for using calcium carbonate. Would this be a substitute for the clay, to thicken, perhaps? Also, I'm assuming the sweet almond oil is to help with consistency? But why did you choose sweet almond oil? I was considering adding natural organic Castile soap made of coconut for the foamy action. Considering people use Sodium Lauryl Sulfate-containing toothpastes, I suppose Castile soap might be a good substitute. Have you ever tried doing this? Many thanks for this post! I’m trying to find a non-scented toothpaste. Are there tooth benificial properties to any of the essentials oils or the coconut oil? Could you recommend a good substitute for the coconut oil? Something with less of a scent? I noticed that the calcium carbonate leves a thick residue on the tongue should that be? Want to know what makes natural toothpastes so great? It's the ingredients. Natural toothpastes are made mostly from mint oils, which are completely natural and provide superior bacteria killing capabilities. I'm all for all natural toothpaste. Do they all taste the same or some better than the others? Regardless of whether you are searching for a steam cleaner or complete carpet cleaning service, Organic Carpet Cleaning NYC is constantly here to help. The arrowroot powder can be a real problem. It's a starch, and anytime you add water and heat it up, even a little, you're going to make it into a sugar. Brush your teeth with sugar, and you'll get a lot of cavities. The way to test this for yourself is to mix some arrowroot (1 tsp is fine) with twice the amount of water. Heat it up a little (15 seconds or so in the microwave) so that it thickens a bit. Add a drop of iodine. If the iodine turns black, you have a sugar. I did this with a couple of different temperatures to be sure, and even used just warm water from the tap. It took a few seconds longer, but it did change to black. Obviously only using warm or cold water from the tap keeps it from changing into sugar right away, but you also won't have the thick substance that's supposed to act as a foaming agent. Very very useful article for the Dental care, I this this toothpaste is very useful for our teeth, Thanks for sharing your informative article.